(BPT) - Planning a trip for 2016? While the beach is warm and a cruise ship is lovely, you’ve done those trips before. This year you want something unique that will create lasting memories and bring you closer to your family. Travelers enjoy getting a taste of the dude ranch experience blended with a heaping serving of other popular vacation-type activities. Today’s dude ranches cater to a diverse crowd with attractions, services and things to do that travel far beyond the trail. Home cooked cuisine that oftentimes features ingredients from the ranch brings new meaning to farm-to-table eating. From family-style meals to gourmet al fresco dining, the food is a central part of the dude ranch experience. You can learn traditional ranching skills like riding a horse, driving cattle and throwing a lasso, but adventures on a dude ranch don’t stop there. 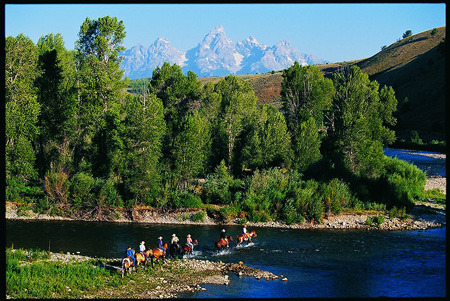 Some ranches offer overnight pack trips, rodeos, target shooting, zip lining and white water rafting. Casting your line has never been more relaxing than at a dude ranch. The vast acres on these private properties often include secluded rivers and ponds ripe with fish. Forget about battling overcrowded hot spots - the water will be all yours. While the unique dude ranch activities will keep you busy, there comes a time when cowboys and cowgirls just want a little rest and relaxation. Fortunately, many ranches now offer luxury spa services so you can enjoy a little pampering. Looking for a fun way to connect with your family and other guests? Friendly competition can be found in many forms on dude ranches, from roping contests to talent shows. If lassoing a speeding calf isn’t your forte, you can sing, tap or joke your way to local stardom in a talent show. There are a lot of dude ranches to choose from and The Dude Ranchers' Association can help you find the perfect one to suit your family’s unique personality. Visit www.duderanch.org or call 866-399-2339 to work with someone directly to find the dude ranch right for you and your family.